Disney Babies Blog: Flashback.. Tuesday? I don't usually have good flashbacks to share, but this one - for me - was too good to pass up! Looking through an old wallet, I found not only my key to the world card from a trip in 2004, but a dining reservation confirmation. Make sure to check the date and time the ADR was made! Now, I have a lot of luck with same day ADR's, but I'm not sure this one would be possible today! 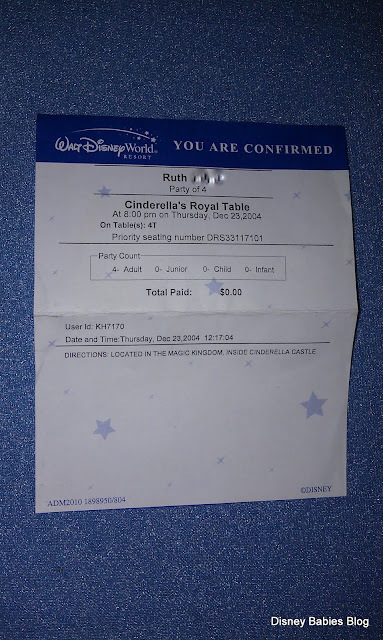 Oh - and on the back of the receipt was our confirmation for a resort - we went to guest relations and booked a room at All Star Music for that night - December 23rd - for... $49. $49 is nearly half of the price of All Star Music during normal season, so that seems like a crazy number to me! I love finding things like this! Isn't it crazy how much the prices have changed in such a short time?? The first time we ate at the Castle, we walked up to the reservations desk at 10 in the morning and had lunch a couple hours later. It is pretty darn cool when that happens! While I doubt that will happen at the castle, I'm hoping that's they way most places will become now that they're asking for reservation fees! Wow, very cool! That wallet is full of pixie dust! I'd start using it again if I were you and maybe buy a lottery ticket too!! Love Cin's Royal Table. Nothing quite like it.